*bows* I apologise if my blog updates have been becoming less and less frequent, but since Christine seems to be the only person reading my blog anyways, that's no big loss. I've been keeping myself busy with doing geeky things, while avoiding the things I really should be doing. It really is great fun! My Nintendo Wii is still a god, and I have been watching anime like there'll be no tommorrow. Can't wait till school starts though, I miss studying. As strange as that may sound (I really quit enjoy it). But anyways, I'm getting way off topic here. The other day, I was surfing the "Extended Discussion" board on Gaia Online, which seems to be the only place you can go to have an intelligent conversation on that site. As I scrolled through the dozens of religious arguments and pro-feminism topics, I finally found something that caught my eye. Someone had made a topic about "love" and what it means. She asked that we each respond and describe what the word "love" means to us personally. I thought this was really interesting, not because of the topic in general, but because of the surprising array of different descriptions. It's really interesting how a universal idea like love can take so many different forms and mean as much or as little as a person wants it to. Fascinating stuff. 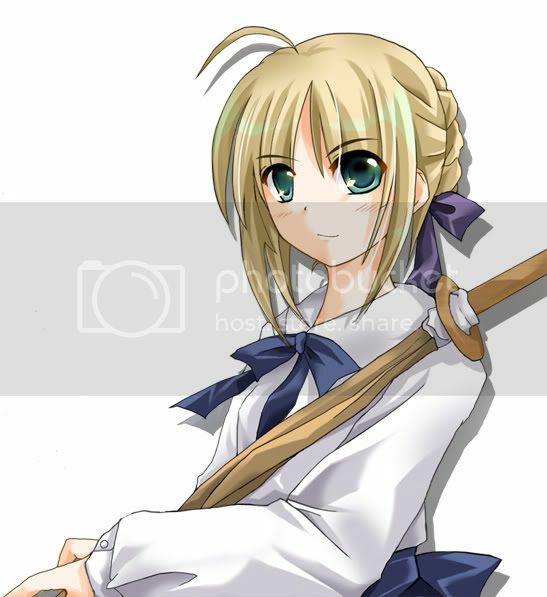 Love is Saber from Fate Stay Night. ... Not really, but I felt like sharing a pic of this awesome character anyways. My new favorite! You had people who were obviously in the middle of a relationship, and stated that love was the feeling that two individuals share when in each others arms (gag!). There were others that believed that true love doesn't exist (emo types). I quote a strange looking Gaia avatar when I say "When you can levitate a skittle, you are in love." What surprised me most was how narrow everyone's description of love seemed to be. They didn't seem to get that love, no matter which was you look at it, is everywhere we go. Below I will attempt, with questionable quality no doubt, to write down my own description. Why? Mostly because I'm bored, but also because I consider myself a "lover" in the most traditonal sense. I love to love life. xD That made... pefect sense. "Love is what drives us, without love we have no reason to go on. The entire reason we live is to love. When one witnesses a beautiful orange sunset, is one not feeling love? When one enters their house to watch an episode of Stargate SG-1.. is that not love? When you look into the eyes of someone you care for, and they stare back with the same intensity, are you not feeling love? 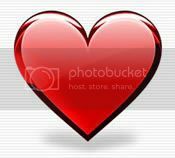 It is my humble opinion that love isn't something you can classify, for it embodies all things good and all things pure. If you enjoy doing something, you are performing an action of love. If you're cleaning the house for your mother as a surprise when she gets home from work, you are perfoming a labor of love. When you kiss your significant other softly on the lips, you are performing a very tender act of love. We can't survive without love just like we can't survive without oxygen. Remember that really sappy oldies song? 'Love is Like Oxygen?' They had it all right. Love makes you high." That was weird. *laughs* I just made that all up in five minutes, so if you were expecting poetry, you came to the wrong place. I actually quite like it though.. especially the Stargate reference. That was a very nice touch! To close my thoughts, don't be afraid to let love in. Love is amazing. A cute picture of an anime that is everything but. Prepare for a dark depressing ride through the human condition. What I Liked About Evangelion: I'll just say it straight out, I went head over heels for Evangelion. It was the best anime I had seen since Eureka Seven, and that was saying alot. Sure, there were giant robots protecting Earth from an unknown alien force, but it was done so well that I really didn't care how silly the plot was. 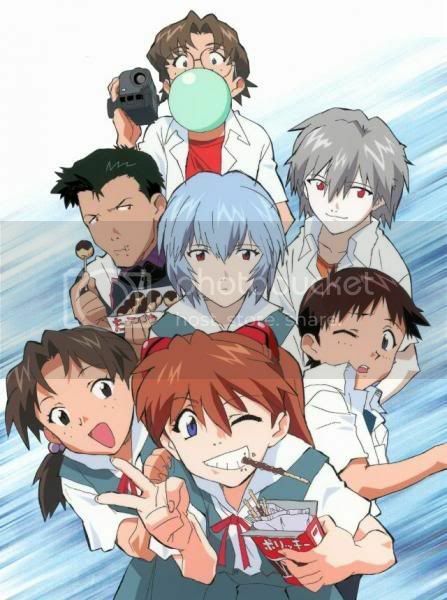 EVA (Evangelion) was one of those anime that you completely forget that you were watching a cartoon. These characters feel more real to me then in any recent Hollywood production, and I couldn't wait to see how the show's numerous mysteries were going to unfold. Which leads me to why I hate EVA now, after watching the entire series. What I Hated About Evangelion: This perfectly engaging show is ruined by what is perhaps the worst conclusion I have ever seen to any kind of story (and I've seen alot of bad endings). It left me speechless, wondering what the hell the writer/director was thinking! It feels like a cold hard slap in the face after all the time you spent watching the show. Nothing is explained, the plot dives straight into script hell, and I'm left angry and bitter. Thanks alot EVA! You just ended up being another "Lost".
" When one enters their house to watch an episode of Stargate SG-1"